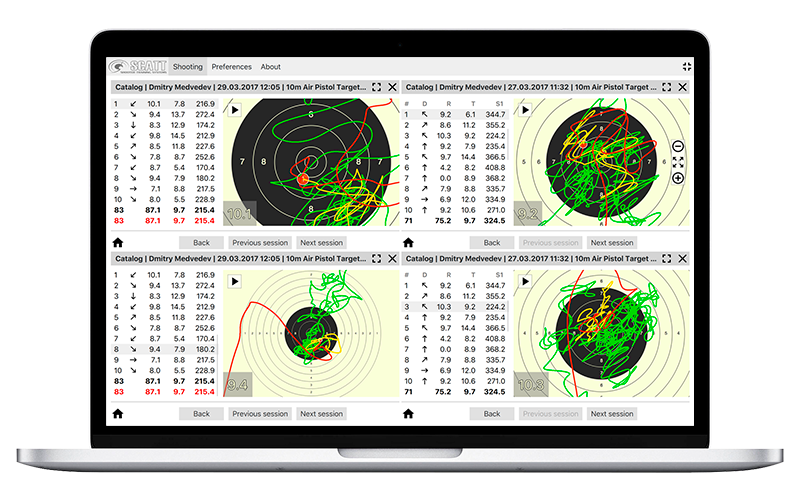 New, cross platform SCATT Basic software - offers the most valuable training features and supports the most popular targets, including 10, 25, and 50 meter pistol and rifle targets. On the screen are conveniently placed: the aiming trace and the most significant parameters of the shot. Yellow (the interval of 1 second before the shot) - visually distinguishes on the trajectory line the most significant part of the aiming process. Used to analyze the stability and the characteristics of the aiming in general. Aiming Trace – measures the weapon’s movement relative to the target, both before and after shooting. Accurate measurement of the trajectory provides precise information about aim and point of impact. Aiming Time - sotware displays the time from start of sighting to the shot moment. Aiming Trace speed - this parameter "S1" shows the length of the aiming trace for one second before the shot. Allows you to evaluate the shooter's stability. 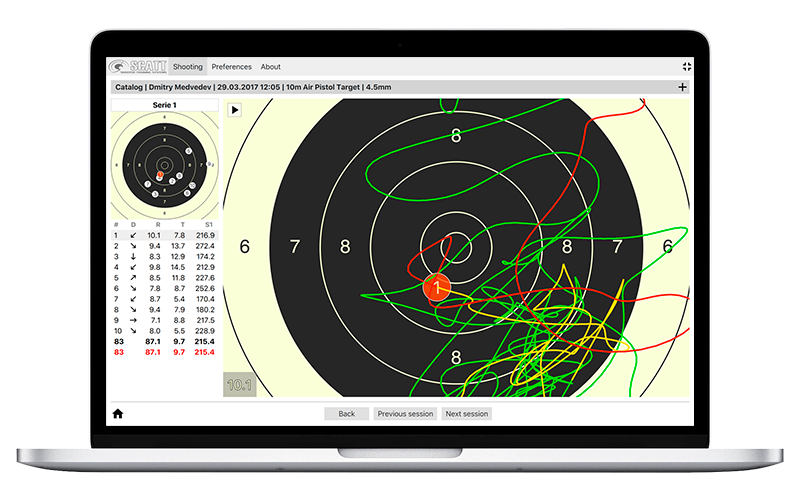 Zooming onto the target, with the help of the mouse or keyboard, will let you closely scrutinize the section of the trajectory you are interested in. The program can replay the aiming trace right after the shot is fired, as whilst aiming, the shooter is unable to watch the computer display. Multi User mode - in this mode, up to 4 SCATT Basic optical sensors can be connected to one computer simultaneously with fully independent settings of the shooting exercise. The software allows you to change the interface settings: colors, size and font style can be changed in accordance with the user's taste preferences and adapted to the size and resolution of the screen. SCATT Basic software is existing for the Windows and Mac OS computers, Linux version will available soon.